There’s a set number of tickets so it’s relatively intimate (buy them here), and there’s enough room to dance with no crazy lines for drinks and such. 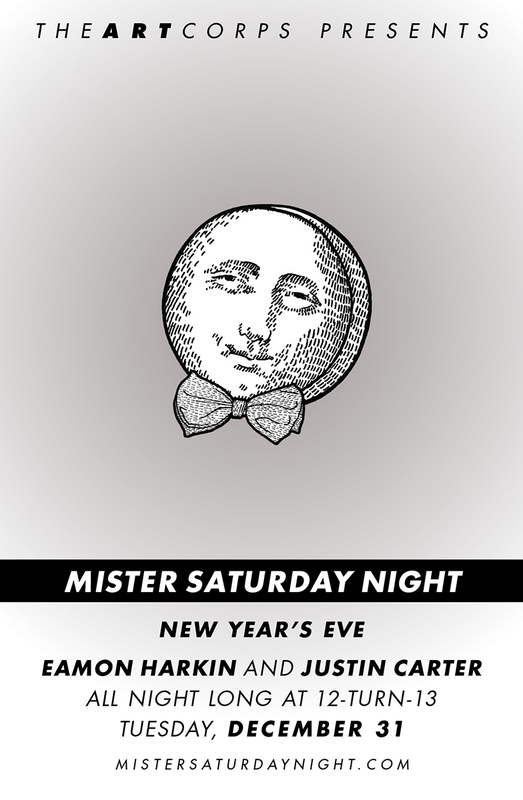 We let the ball drop in an easy-going way, so it doesn’t feel too forced; we stock the bar with bubbly, and, as usual, we set up our soundsystem, abandon our cell phones and cameras for the evening, and let Eamon Harkin and Justin Carter loose on the turntables. 12-turn-13 will be decked out from top to bottom in black and white, and we’re asking you to deck yourself out in all black and white, too. You don’t have to wear a tux or anything (though you certainly can if you want), just whatever’s comfortable for you. The festivities start at 9pm for folks with tickets, and if you’re celebrating the ball drop elsewhere, the doors will open for non-ticket holders at 2am. No matter when you come, we’re looking forward to kicking the year off with you. Yeah, all our nighttime parties at 12-turn-13 are 21+. Mister Sunday is always all ages, though. Just got my act together and want to join the fun this Tuesday. Did I miss the exact location for this party or is this still to be shared? We’ve updated the blog post with address details, Pip. And 2am is a good time to arrive Mister Three. Space permitting you’ll get in then.